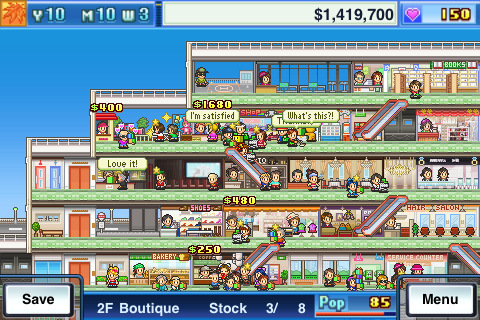 Mega Mall Story is an addictive management-simulation iPhone game from Kairosoft, a Japanese game company specializing in cute mobile sims. Kairosoft’s games are all similar in feel; if you enjoy one of their offerings, you’ll like them all. If the idea of managing a mall doesn’t appeal to you, they offer games in which you can manage schools, racing teams, and even game development companies. I can’t speak to Kairosoft’s other iPhone apps – though Game Dev Story sounds fascinating – but Mega Mall Story is fun and well-made. Its Japanese roots show in its kawaii aesthetic and some of its details, but it translates well for a US audience. The excellent pixel art graphics add to the game’s playful charm, giving it an almost dollhouse-like atmosphere. In managing your mall, you control a variety of factors: the types and placement of the stores you build, the amenities you offer, the staff you hire, your advertising budget, and so on. There are also variables beyond your control: the weather and economy change, and other malls may move into the area to compete for your customers. Your long-term goal is to attain mega-mall status. Though it takes a while to complete a game, it’s easy to play in either short bursts or longer stretches, and it’s easy to get sucked in. With multiple save files and an autosave feature, you can leave a game in progress and come back at any time. Though the game is easy to learn, and begins with a brief tutorial, it could still benefit from a beefier help section. A few features are never explained, and others are only briefly touched upon. A little more explanation would make the game a lot more exciting. Mega Mall Story’s subject and style seem particularly suited to younger female casual gamers; after all, malls are considered the domain of teenage girls. But the game never feels like it’s deliberately aiming for a female audience, which is to its credit. If a charming, happy, absorbing game about a mall appeals to you, Mega Mall Story is worth your time. 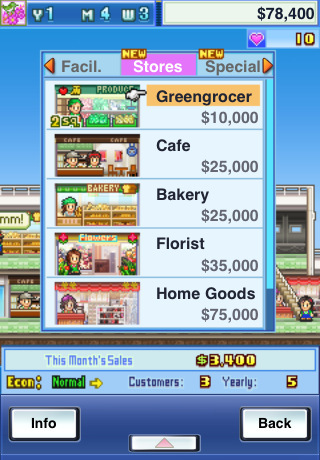 If you’d rather not manage a mall, however, the rest of Kairosoft’s games look equally promising. AppSafari review of Mega Mall Story was written by Katherine Thorne on September 20th, 2011 and categorized under App Store, Games, Resource Management, Strategy. Page viewed 5905 times, 2 so far today. Need help on using these apps? Please read the Help Page.